I’ve just about lost patience but what that means I’m not sure because I’ll still keep turning up at the Kassam Stadium and try to support the team with a measure of tongue biting so that the disillusionment I feel deep inside stays there and does not spew out and in any way add to the negativity that hangs over our football club. There’s a bit of spewing to be done now though. It was a local derby of sorts and we’re sitting in a play-off spot but the gate of just 4,606 highlights the current sorry state of affairs. Even if we’d not conceded that mega fluke to drop yet two more home points I wouldn’t have been even close to being happy with the display. Cheltenham had been that bad. We were no better but such was the all round ineptitude on display I would not have been surprised if we had come out winners after Ryan Williams had done the business. But neither was I surprised when we did concede. This just led to my already seething anger shooting a couple of notches higher. And then when I heard what Mickey Lewis was saying on the Radio post match I couldn’t believe it. How can a manager, caretaker or otherwise, be delighted with a performance like that? No Mickey, we did not play well. No, we did not carry on like we played in the second half against Burton. And I don’t think there are many fans that were happy with Deane Smalley’s performance. Deluded, I’d say. And I’d also call anyone deluded who thinks Mickey should be guaranteed the job until the end of the season – that’s you Nick Harris. I’ve since heard that the players were pretty happy with it all and Mickey has now come out and said he thinks he’s the right man to be leading the U’s. I don’t think I can take any more performances like this without exploding. If there is a new manager lined up for the start of next season, then so be it. But why not get someone else in, short-term on a decent whack with the sole brief of getting us up? Someone who can get a better return than two points from fifteen. Someone who has proper motivational skills and noticeable tactical ability. I heard this from a fan who doesn’t normally talk in a crude fashion as we left our seats at full time, “it’s as plain as I’ve got a hole in my **** that Lenagan needs to replace Lewis NOW”. I feel frustrated. I feel we’re being left in the dark. For those who wanted Wilder out, isn’t your job only half done? Shouldn’t you now be campaigning even louder to get a permanent appointment before this season crumbles into dust like so many more before have done? At the end I wasn’t unhappy to see Wilder go given the boredom suffered at home but I’d much rather he were still in charge than what we’ve got now. Since when has Beano been a right winger? What was a central midfield two of Josh Ruffels and Johnny Mullins all about? Can someone at the heart of the club please tell me why when we get a free kick on the half way line we don’t get numbers in the box and launch the ball in the direction we are supposed to be attacking? A quarter of an hour in we took a free kick in such a place. We played it short, we played it sideways, we went backwards, we dicked about, we lost the ball. It provided Cheltenham with more attacking opportunity than it did us. I’m still angry writing this a couple of days later. Many of our senior players are nowhere near the form they showed earlier in the season and we don’t seem to have much of a game plan. There were bits from David Connolly and Ryan Williams too but for the most part the player on the ball had no options with support sadly lacking. Yes, there were the odd glimpses of something that hinted there might be a decent football team hidden away there somewhere but it didn’t take long for that myth to be dispelled. 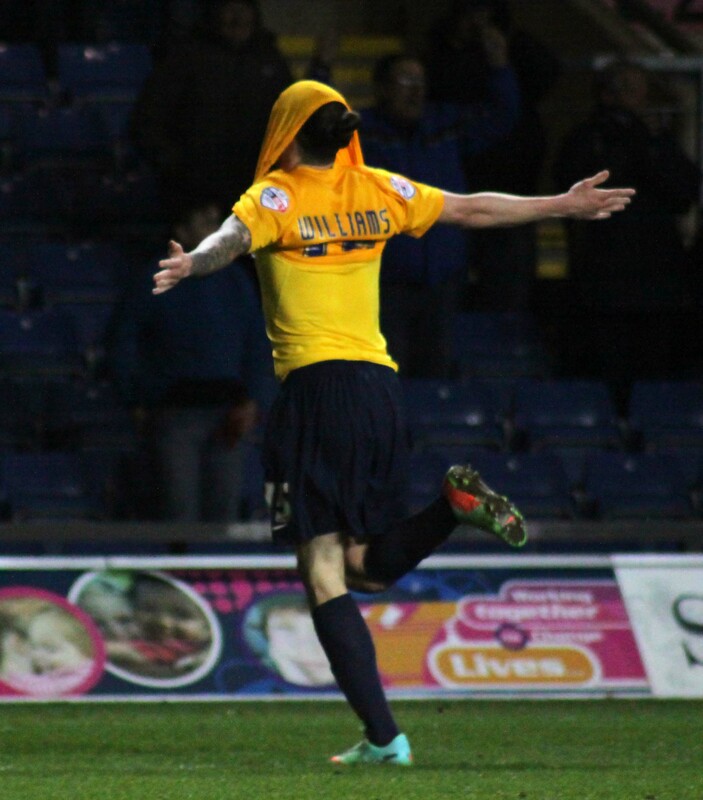 In the first half Beano produced one of his best ever runs in a yellow shirt to set up Smalley. One heavy touch later and he might as well not have bothered. I also thought Beano should have done better himself with a couple of chances. Let’s be honest here – OUFC legend, yes, well kind of, but his recent goal scoring record has not been very good has it? He’s not even hit double figures yet this season. Sadly, no one has. I can’t remember their keeper actually making a save in the first half. But this is the nuttiest of mad seasons and every team at the top has frozen. Of the top seven on Tuesday six drew and one lost. So to the team that pulls itself together the spoils. From what we’ve seen recently the quality of League Two this season isn’t all that so FFS let’s start winning games of football again. Because if we don’t this could turn into one of the worst seasons ever. The breakers from the pack are getting close to some neck breathing. Plymouth have won four out of five and York the last three. I and many other fans have spent a lot of time and money watching OUFC this season. For spent that should really read wasted. We’re ultimately getting nothing out of it other than anguish and pain. I will continue to spend / waste time and money watching my football club through to the end of the season. But as for spending/ wasting time on anything else to do with Oxford United, such as writing the Fan’s View, the way I feel at the moment is that I really can’t be arsed. I feel let down once too often. Three in midfield, great -but debatable that they were the right three. Other than the opening exchanges when David Hunt unleashed a superb shot and a spell of no more than 10 minutes in the second half we were nothing. We have a few players who even at their very best are no better than very average League two players. In Connolly we have a footballer of class who makes our most talented youngster, Williams, so much more effective. He might be quite old in footballer years but I’d hazard a guess he had more than 10 minutes in him. But by then the game was up. “We want a manager” – I had that buzzing round my head from a few minutes in. Before the end of the game our away following which in the circumstances wasn’t half bad were singing it out loud – “WE WANT A MANAGER, WE WANT A MANAGER”. There was one good thing about the day though, and this is a recurring theme – beer. I was not driving and the Derby Tup, with multiple hand pumps, is but a few minutes walk from the ground. This made the day bearable. Right that’s it, this is the quickest I’ve ever concluded a fan’s view after a game. It is now 8:30 p.m. just three and a half hours ish since the final whistle. I’ve had it up to here. Time for more beer. This entry was posted on Saturday, March 15th, 2014 at 10:55 pm and appears under Articles, Comment, News Items. Both comments and pings are currently closed.